The DCX-22 Self Contained Water Level Dataloggers are highly accurate, self-contained, battery powered absolute pressure water level loggers designed to record water depth and temperature over long periods. The absolute pressure water level sensor, electronics and battery are housed in a rugged, double-sealed 316 stainless steel tube for long term submersible deployment. The DCX-22 Self Contained Water Level Dataloggers require no external wires and may be suspended with any suitable and secure cable. When it’s time to download the recorded data, the DCX-22 Self Contained Water Level Dataloggers are simply retrieved from the measurement point and the double sealed end cap is then removed to access the absolute pressure water level sensor's data port. When using the DCX-22 Self Contained Water Level Dataloggers in shallow water depths where the influence of barometric pressure changes should be considered, the DCX-22 Barologger is placed at the surface near the Self Contained Water Level Datalogger, to record the barometric pressure. The two values are then quickly and accurately correlated by the software once the data files are downloaded to your PC. The DCX-22 Barologger is built to the same exacting specifications as the DCX-22 Self Contained Water Level Dataloggers except that its sensor and electronics are calibrated to read and record barometric pressure. With this software the DCX-22 Self Contained Water Level Dataloggers can be configured and read out. The absolute pressure water level sensor's data can be processed i.e. graphical representation, exportation, compensation of ambient pressure as well as conversion into water level. The online function shows actual measurements of the Self Contained Water Level Datalogger. Due to the modular structure of the software, customer-specific data formats can be implemented on request. 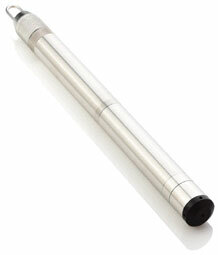 On request, a handheld WindowsCE application for the absolute pressure water level sensor's data read-out is available. Self-contained Water Level Dataloggers work well for many users because the depth of deployment is not dependant on the length of the cable. For example, a 15' water level datalogger with vented cable might come with 25 or 30 feet of cable, which is the best solution if you know exactly where the water level datalogger is going to be installed and only foresee using it in applications with similar or shorter cable requirements in the future. But if you need to drop the water level datalogger over the side of a bridge, or off a high dock, or down a deep well hole where the static water level is many feet below surface, the water level datalogger's 15' sensor range is great but you might have to have 200 feet of cable to get to the water level measurement point. The self-contained Water Level Datalogger really shines in these situations, even though it requires a greater investment and requires a barometric compensating datalogger for full accuracy.